I'm new to the forums and thought I would post on this (new-to-me) crew cab I was able to pick up for $800. This was found in our local classifieds news paper. I hope to get it fixed one day and post the project updates as I move along. Welcome aboard J. That sounds like a steal of a deal. The truck looks pretty straight too. I assume that it doesn't run. Where bouts are you and the truck located? Looking forward to seeing your updates as things progress. I like it. Has a Colorado plate on it. 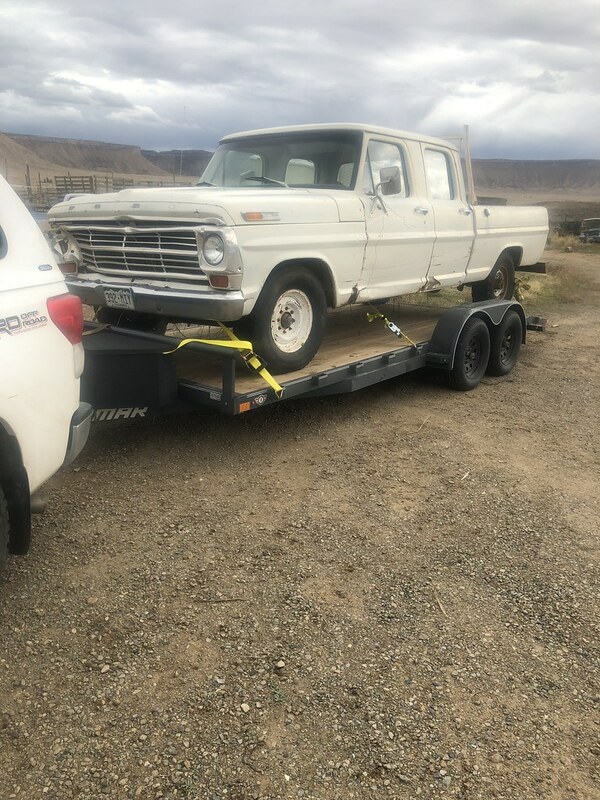 Looks like a really solid truck for 800 bucks and a great place to start a project from. I live in Northern New Mexico. The truck was located outside of Cortez, Colorado. I got it home and found only the carb, coil, alternator, battery and solenoid were missing. I went to the local parts store to get what was missing that I didn't already have on hand and put all the parts on and the only thing I could get to work was the dome light. Several days of tinkering didn't get me any further. The wiring harness had been hacked so many times it was nearly impossible to trace the wiring, some of which was severely burned. I had a spare untouched harness in the garage from another 69 F250 and spent an afternoon swapping out the harness and got it running. I didn't notice any strange engine noises or smoke so it looks like a good foundation to start with. That's some good progress already! Even if you don't intend to keep that engine in it, it's nice to have it moveable under it's own power while you work on it. I spent the day rebuilding a wiring harness in an old Freightliner, I feel your pain. Some people should not be allowed to own wire cutters or crimpers!